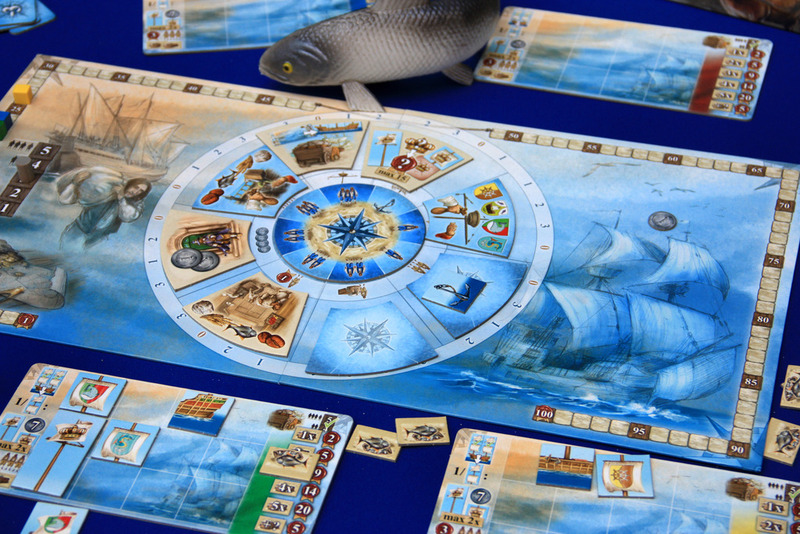 Players take on the role of shipbuilders – during the game, players build ships, putting masts and sails on those ships, and then stock those finished ships with goods. 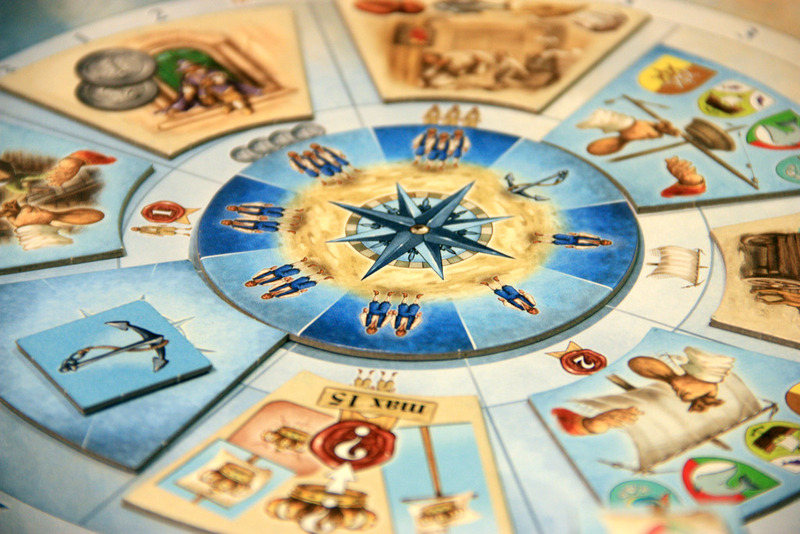 The majority of the action takes place around a wheel in the center of the board, where the 8 possible actions each turn are shown on tiles. In each round in the game (5 rounds in a 3 or 4 player game), 7 of these 8 actions are taken each round. Each player uses the table in front of him as his shipyard. He also has a warehouse in front of him which can store ship pieces and goods which are not being actively used at the time. Once a piece is being built in the shipyard, it cannot be moved any further.On each turn, the active player chooses any available action (i.e. one which has not yet been chosen this round) to take. On the action wheel, beneath each action tile, there is a bonus which is given to the player who chooses that particular action. The bonuses are printed directly on the board while the action tiles are in different slots each round. I’ll go over the bonuses later. Once the bonus is taken, starting with the active player and moving clockwise, everyone has the option of taking the chosen action or not. Note that the active player could choose an action to only get the bonus and pass on the main action. In the very center of the action wheel are some blue workers (0 to 3 per slot). Each player can use those blue workers to perform the chosen action. This number can be supplemented with workers from the players supply (you get 4 to start the game and can earn more workers from bonuses). Each of these actions uses the outermost ring on the action wheel as well. In each segment, the numbers 0,1,2,3 are randomly ordered on each section. These numbers line up to the four options for purchase on each tile (Wheel, Dragon, Kermit face, and Whale). Purchasing any object takes one worker and then a cost in Taler equal to the number above it on the action wheel. If you want to buy multiple copies of the same thing, the first instance costs the action wheel price and all other copies cost the maximum 4 Taler. If you purchase one of each of the four different options – which will always cost you 4 workers and 6 dollars (0+1+2+3) – you will receive one free tile, the type to be freely chosen. Once you have purchased your tiles, you can use them to build. One exception here is that any tiles gained this turn which did not cost any Taler (cost of 0, earned through bonuses or for buying one of each type of tile) must be placed into the warehouse. They cannot be placed directly into the shipyard. All other tiles can either be immediately build in the shipyard OR they can be placed into the warehouse for later use. When building hulls, ships can be either 1, 2, 3 or 4 segments. (The 1-size ship fits on a single tile!) All ships must have a bow and a stern. They may have 0, 1, or 2 middle sections. Once a ship has been built with a bow and stern, a middle section cannot later be placed in the middle! Masts can only be placed on ship pieces actively being built in the shipyard. Furthermore, a single ship must have matching masts; different mast types cannot be combined in a single ship. The exception here is that the special crown icons are used as wildcards and can be placed on any ship. Sails, unsurprisingly, can only be placed on masts which match their icon. Thus, it follows that a single ship will also only have sails on one type. Again, Crowns can be used as wildcards. You can take each option a maximum of twice for any completed ship. If you take the mast, sail or goods tiles, those must go into the warehouse as you did not spend any Taler for them. Goods (four different types – fish, coffee, wheat and salt) – can be purchased and they can be mixed on a ship. Only one good tile can fit on a ship section; so a ship can hold anywhere between 1 and 4 goods depending on its size. There are four beige colored action tiles – these actions do not require any money to trigger them, but they still need workers. The transport action is the way to get tiles out of the warehouse and into your shipyard. For each tile that moves, you must use a worker. Your warehouse is space limited, so you need to constantly be building ships and moving stuff out of the warehouse or else you won’t be able to buy anything else that needs storage. Money is surprisingly tight in the game, and the collect money action provides 2 Taler per worker used. Delivery of goods is a bit more complicated. The action can only be done by players who have a fully built and loaded ship – i.e. enough hulls, masts, sails and filled with goods (1 good per hull section). It costs one worker per goods tile, and when you sell goods from a ship, you must sell an entire ship’s worth of goods. You get no immediate benefits of selling goods, but they are used in endgame scoring. The final free action is scoring crowns. There are two main ways to get crowns. The first way is to choose them as bonuses from finishing construction on ships. The second way is to use your pass tokens. Each player has 3 pass tokens, with -3VP, -2VP and -1VP on the back of them. At the start of each round in the game, players have them with the negative VP side up. If a player passes on the chosen action in a turn, he gets to flip any of the negative VP tiles over to the crown side. When the score crown action is chosen, each worker used scores 1VP per crown visible (either on a ship, in the warehouse or on a pass tile). The maximum number of points that can be scored for this action is 15VP. If you are the start player, you simply get the bonus associated with the space that you choose. The bonuses are preprinted on the board, but the action involved with it and the number of free workers for that space will change based on the randomized setup for each round. Along the way, players each have the option for a single extra action – each starts with a tile that can be used once to take a special action. This can be taken at any point on your turn. You essentially choose and of the 8 basic actions and get to take it with 2 free workers. If you choose a buying action, the cost for the first of each type is 2 Taler. It still costs 4 Taler to buy a second instance of any type, and you still get a free tile if you buy one of each type. At the end of the game, there is a final VP determination. First you look at each type of good. For 1/2/3/4/5/… of a particular good, you score 2/5/9/14/20/+5… Then, you get a bonus for each completed ship you have. For a ship of size 1/2/3/4, you score 2/8/20/35 VPs. Finally, you get 1 Taler for each worker, tile in the warehouse, tile in unfinished ship in the shipyard, and undelivered good. Taler are then converted to VP at the rate of 3 Taler to 1 VP. The winner is the player with the most VP. For me, this is a pretty typical K&K game – solidly constructed and well balanced. Once the game is in full swing, you seemingly always want to do more actions than you can afford with your current worker and money situation. Given the relative scarcity of both workers and money, you are constantly forced to re-evaluate your needs to figure out how to best use your limited resources. There is a lot of timing issues in the game that you have to monitor. Knowing that you only get 4 or 5 chances to buy ship parts, and that the order in which those options come up in are not fully under your control means that you really have to be ready to buy and build when the opportunity presents itself. It also means that if you don’t time things right, you may not have a lot to do in the last round. The math is brutal – as you can see, there is a huge bonus for shipping a lot of the same type of good and for building larger ships. Taking a 4 masted ship (4 hulls, 4 masts, 4 sails) as an example, this scores 35 VP when complete, but if you are missing only one piece, you would have 11 unfinished pieces which yield only 3VP and 2 extra Taler. While the risk/reward definitely pays off for those who are able to complete the ship, the penalty is too severe and this has ended up stifling play in my experience. The game can also turn negative in the final round as once you realize you can’t finish your ship, your best play is often to try to choose actions in an order to screw someone else out of finishing their ships. While there’s nothing wrong with this sort of interaction, I am personally not a fan of that type of play. Our games have been on the slower side. My local group is usually pretty fast, but we’ve been lucky to get our 4p games played in a time less than 2 hours. I’m not sure why this game takes us so long, but each time after we’re done playing, I’m a bit surprised how long it has taken. To be fair, it doesn’t feel long because I’ve actually been surprised at the game length (so it’s not like I was waiting for the end to come), but you do have to set aside a good chunk of time to play this one. As I mentioned earlier, the game is solid, and for the time being, it keeps a space in my collection, but I am not sure for how much longer. For a worker placement game, it is on the longer side, and for a K&K game, it is firmly in the average bucket for them. But, that’s a tough group of games to be judged against as there are many designers whose best design wouldn’t even come close to this one. Joe Huber (5 plays): One key to this game, accidentally discovered during my first play, is that it’s a significantly better three player game than four player game. Not that it’s _bad_ with four; just that it shines with three (and likely does with two, as well, though I’ve not played it with two). Removing one player speeds the game significantly – it _is_ a little too long with four players – and also gives players a little more feeling of control. While I understand Dale’s comments about the negative action selection in the final round, the effect is offset by a bonus action each player can take once during the game. And I understand his concern around the risk in starting a large ship – but as a practical matter, I’ve only once seen a big ship started early not be finished, and that occurred when a player was too aggressive in starting ships. Dan Blum (3 plays): I would be pleased to see someone other than Seyfarth use a Puerto Rico-style action selection mechanism in a game (as it’s a good mechanism which has seen very little use) even if I didn’t like the game that much. 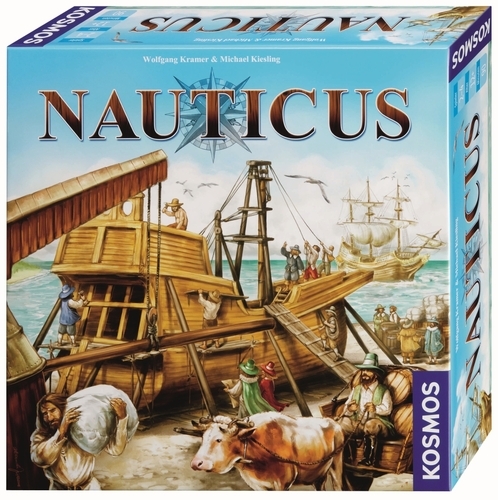 However, I do like Nauticus, so Kramer & Kiesling’s design choice is merely icing on the cake. That being said, I am not sure the game will ever get up to the “love it” range for me. I’m not convinced there will be enough variance from game to game to give it long-term potential; it has only minor random elements and nothing else aside from action choices to create much variance (as opposed to, say, Puerto Rico’s buildings). I’m also a little concerned that the small number of middle ship sections will tend to set everyone’s strategies relatively early in the game. I agree with Joe in his comments on Dale’s issues with the end game. The only time I have seen a large ship unfinished was when a player tried to create two size four ships. I also don’t see much potential for really negative end-game play – everyone should have something positive they are trying to accomplish, whether it’s finishing a ship, delivering goods, or scoring crowns, and so should be choosing actions to get that done. Tom Rosen (1 play): This is the new solitaire game by Kramer & Kiesling from Kosmos. Okay, technically the game plays 2 to 4 players, but I didn’t see any reason to care what my opponents were doing. The game’s mechanisms were relatively interesting, but it really took multiplayer solitaire to the extreme. Usually I like when games allow you to specialize in a particular strategy and not force you to diversify, but Nauticus may have gone too far in this regard. There are increasing marginal returns for focusing on goods or ship building, and these are so significant that you are essentially compelled to stick with your approach for the second half of the game regardless of what your opponents do. I’ve played several games, all online (yucata.de) and all but one 2-player (that is with 3 — ongoing). I can definitely see how the game might be less fun with 4: less control, more player-related chaos in the order actions are chosen. For me, 2 is probably the best number: easier to see what the other player’s setup looks like. And yes, I do care about the other player: it helps to see what actions they might be choosing. The randomization at the start of the round is probably more important, but I still try to take a peek at what the other guy wants. In particular, I need to know what their money/worker situation is so that I can deny them what they need, or anticipate which action they’ll choose early and prepare myself. I also want some guidance as to which actions they won’t be able to take advantage of to full effect (and I should therefore choose earlier). The thing I don’t like about the game is that there doesn’t seem to be much variation in how players earn VP. For example, it would be nice to see a goods heavy strategy work better than it does. Instead, it seems you get most of your points by building some boats (8-10 masts worth, at least in the 2-playery game). Oh yeah, and you also grab any goods that happen to be convenient along the way. Where did all those Puerto Rico corn shippers go? ?